Tobacco hung from her lips and her eyes crinkled in laughter as her busy fingers rolled wads of tobacco into thin cigarettes. 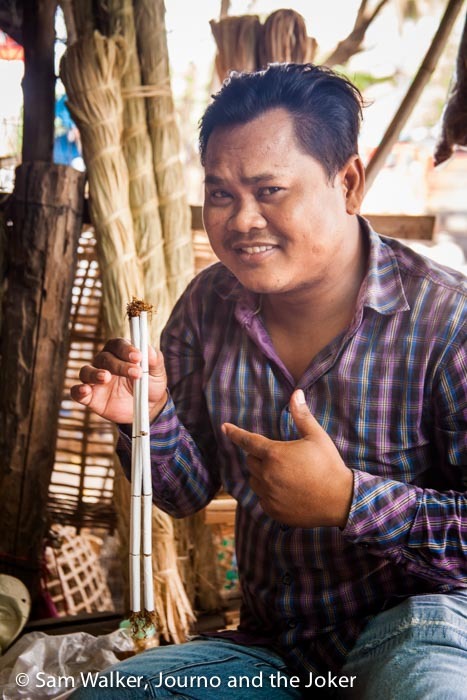 We were privileged to be experiencing a tiny slice of daily life in Battambang. 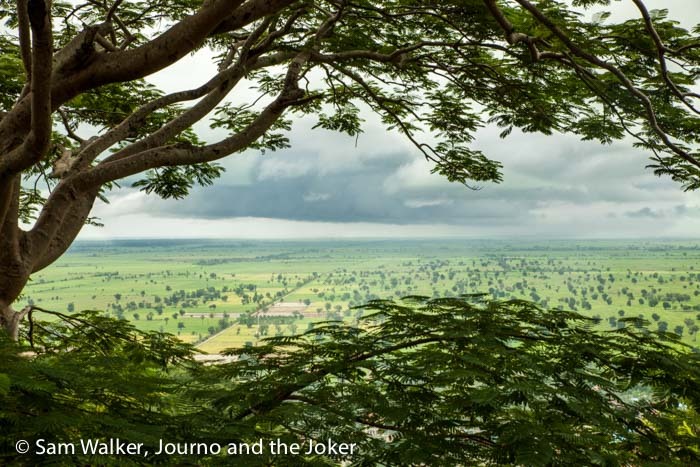 A look at how others live and work and how their day progresses — it’s the ultimate Battambang experience — a look at real life in Cambodia’s second largest city. At 71-years-old this mother of five successful boys has probably spent a lifetime doing this job. Truthfully, with her husband owning a store (which I think she quietly ruled) and her boys working as architects and engineers and in other successful positions, she probably doesn’t need this job. But it is part of her daily life, part of her identity and she is very good at it. 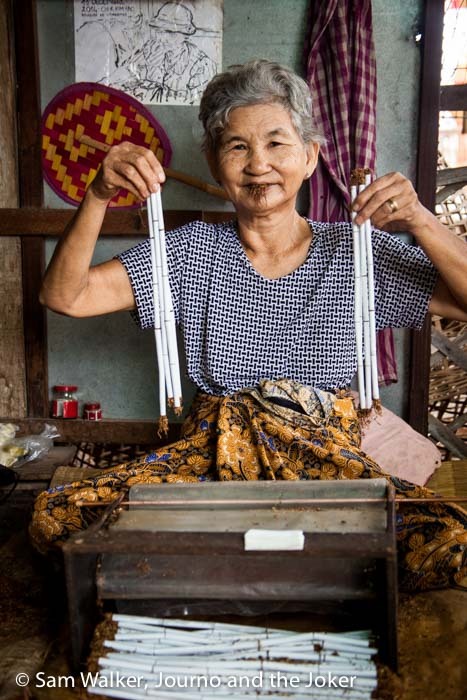 She churns out about 3000 cigarettes a day and sells them at 50 cents a packet — there are 60 in a packet. If my maths is correct, it equates to about $25 a day, which is pretty good money in this country, where many people are lucky to earn that in a week. 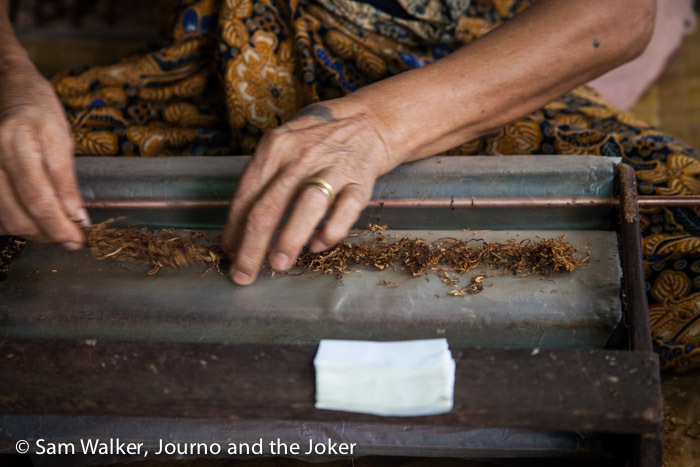 The tobacco comes from Kampong Cham, a province along the Mekong River between Phnom Penh and Vietnam. It’s put in this machine, the papers are laid out and the tobacco is scooped on top of them and rolled. I was spending the day with mum while the Joker and dad were having an off-road motorbike adventure through the surrounding countryside. We didn’t catch this delightful lady’s name but she laughed and smiled a lot and chatted away. A connection was made with mum because they were born in the same year — but there the similarities in life ended. Her tiny workspace, set up next to her husband’s store, at the edge of one of Battambang’s many markets was the first stop on our day tour with Thean in his tuk tuk. And it was probably the highlight of the day. It is hard to imagine what this lady, born in the 1940s, has seen in her life and how she has survived. Thean has clearly taken many people to visit her and see her at work. 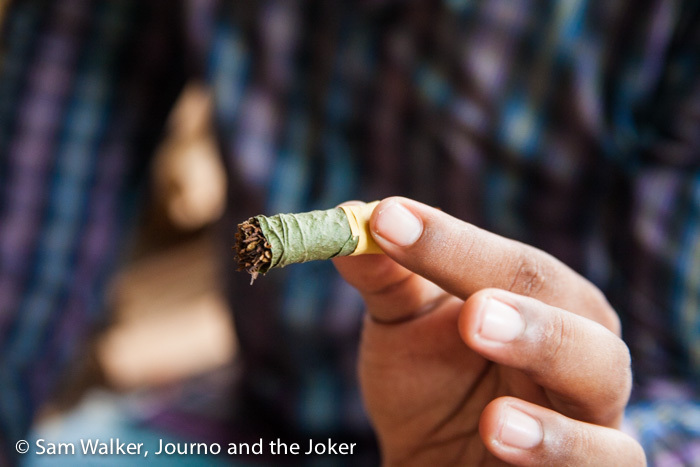 She also makes these more traditional cigarettes, wrapped in the tobacco leaf. And she is an avid user of her own product, although she seems to chew the tobacco rather than smoke the cigarettes. She very enthusiastically offered us some to try but we declined, not being smokers or tobacco users. This brief stop was the start of a wonderful day that took us through local villages to the north of town and into the homes of people making artisan products and staple foods. 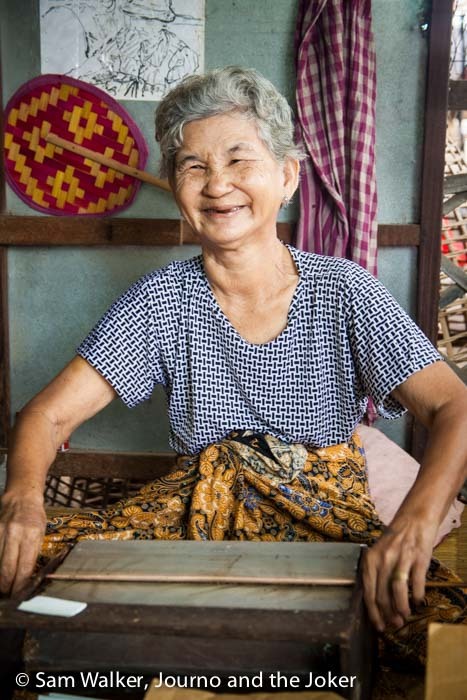 Everything is hand-made from scratch and mass production (on a small scale) happens in small, humble homes and front yards or along the road side. When we set out on our day trip, we had no idea what to expect. 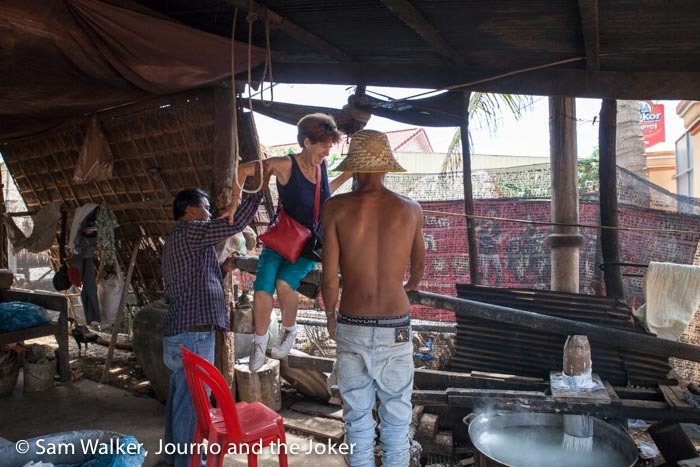 My brief to Thean, who was recommended to us by a friend in Siem Reap, was to take us out into the villages to experience some of the village life and daily activities. He more than delivered on that front. 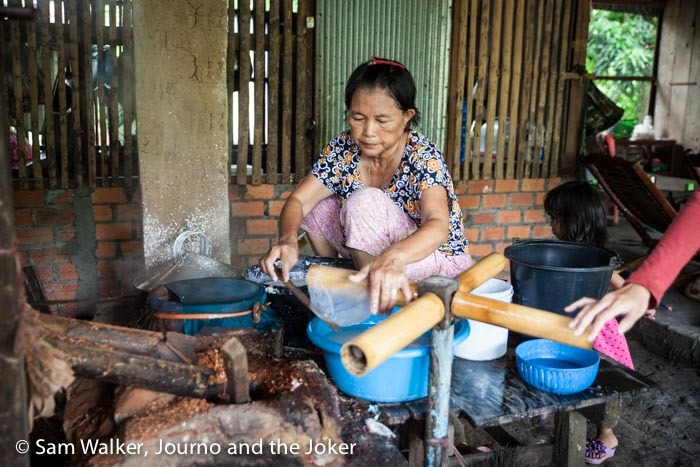 Our next stop was to a small home in the back streets, where a family worked together to make rice noodles. 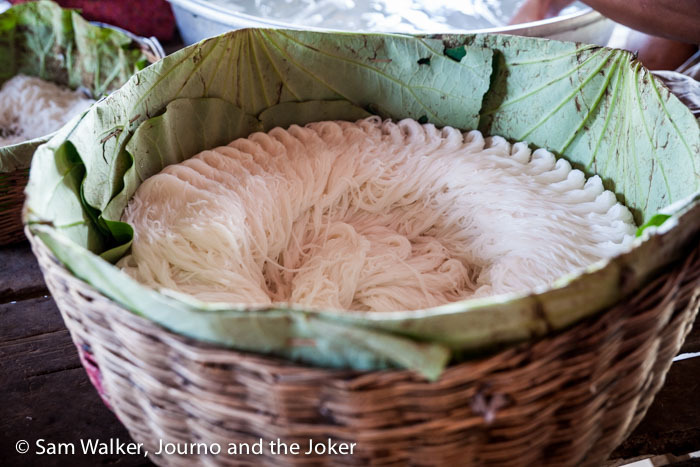 Fresh rice noodles need to be used the same day — or within 24 hours — and what they made in the morning could be found in the markets the same day and at street stalls selling food in the evening. 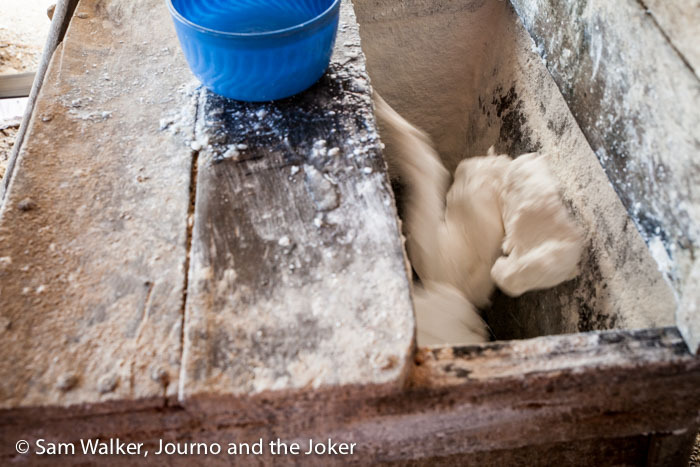 First they mix the rice flour and water in this rudimentary wooden box to make the dough. It is agitated with help from some kind of a small motor — forgive my lack of technical knowledge. Once mixed to the right consistency it is removed and then kneaded. Once the dough is the right consistency it is put in a cylinder with holes in the bottom and is weighed down — this time mum was used as the weight — until the dough is forced through the holes in long strands and falls into boiling, or very hot, water. It is then transferred to ice water and goes through several rinsing processes before being folded and packaged for market. We were asked to give a tip at these few visits, which is not something I usually do in these situations. But the people here had given up some of their time to allow us to walk into their homes and work space and watch what they do. It was only a dollar or two but we did fast run out of small money, having not been prepared for this. 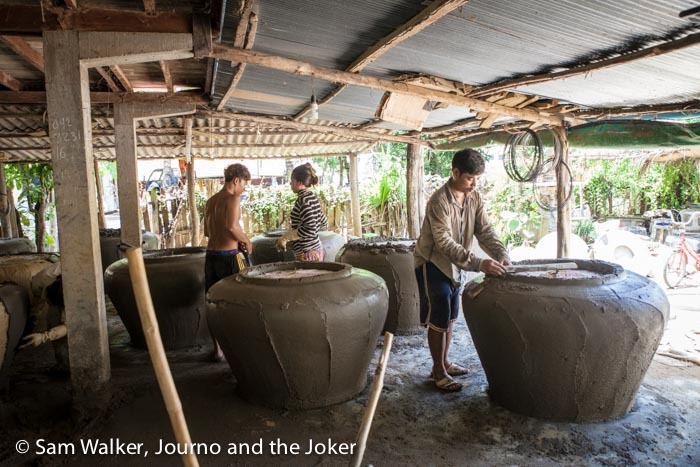 Everywhere you go in Cambodia you will see huge concrete pots. You’ll find them outside homes and businesses and at markets. Often they are used for storing water or other foods. 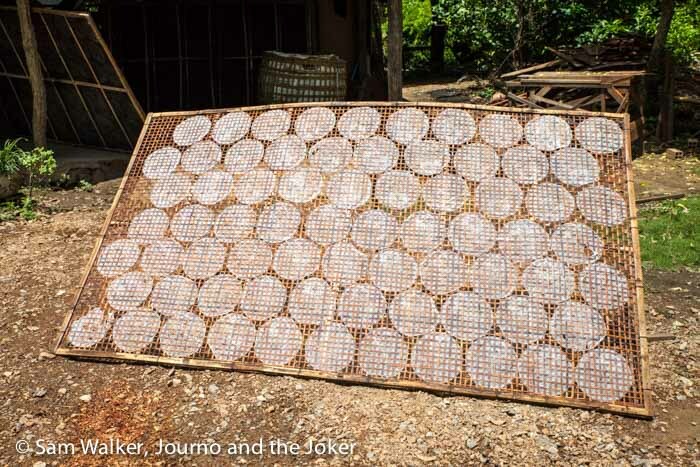 In many cases they are used for water storage. 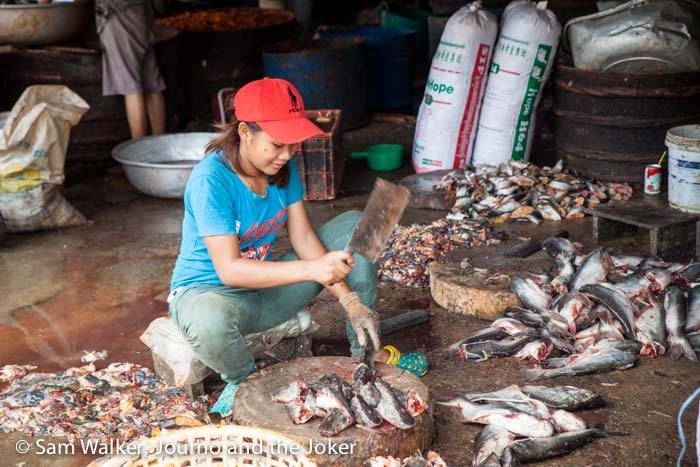 Often they are used to make prahok, a popular fermented fish paste used in many Cambodian dishes. This place made the pots. 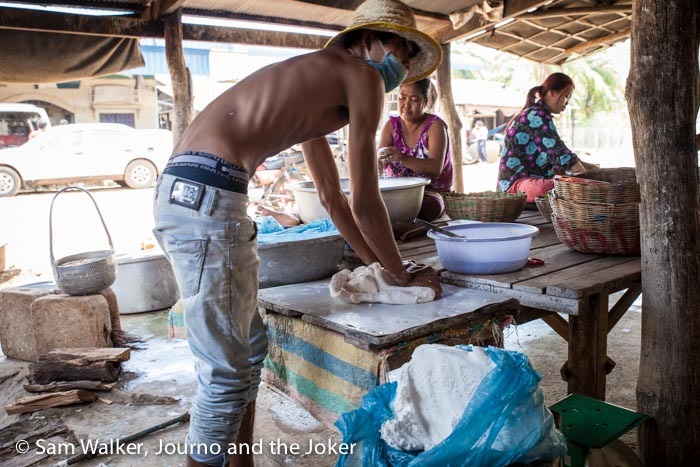 Battambang is famous for it’s sticky rice, and women line the roads making and selling this popular snack. 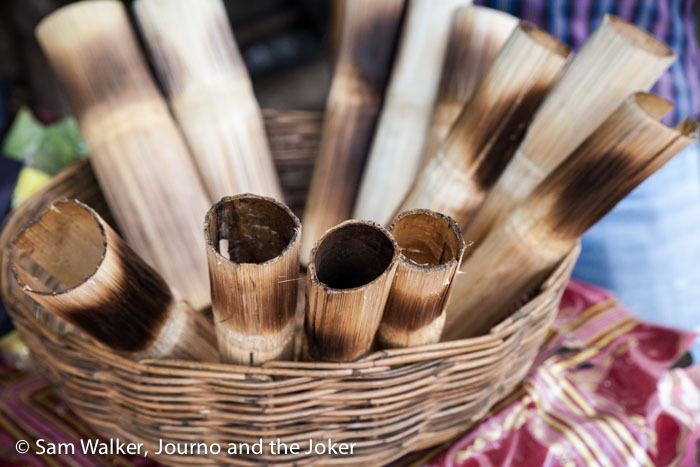 This version of sticky rice is made with coconut milk and beans and the mix is stuffed into lengths of bamboo and heated over coals. You peel the sides of the bamboo back to reveal the warm rice mix inside. 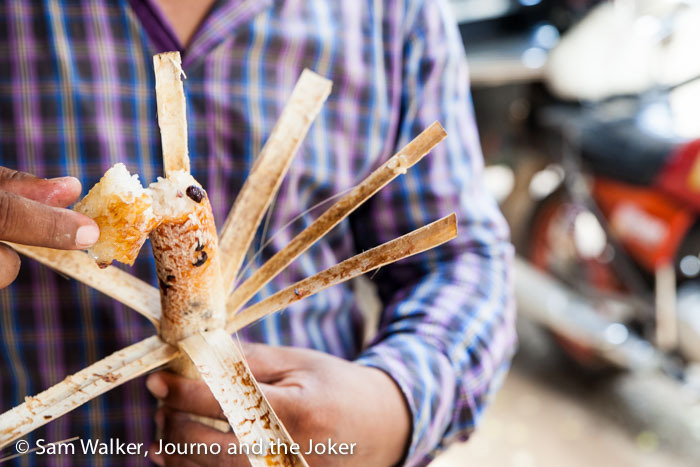 It is one of my favourite street snacks. We also tried Battambang’s famous oranges — which are green. Go figure. They were not quite as flavoursome as I would like an orange to be but, like any fruit, taste can vary depending on the growing conditions. And then we proceeded on to the fish markets. They are a pungent experience at the best of times, and certainly during the middle of the day. Much as I don’t like fish and I hate the smell of fish, I am somewhat drawn to the fish markets. I just love how raw and basic life is in the market. There wasn’t a lot going on while we were there because people were on a lunch break. But a few women were busy chopping. 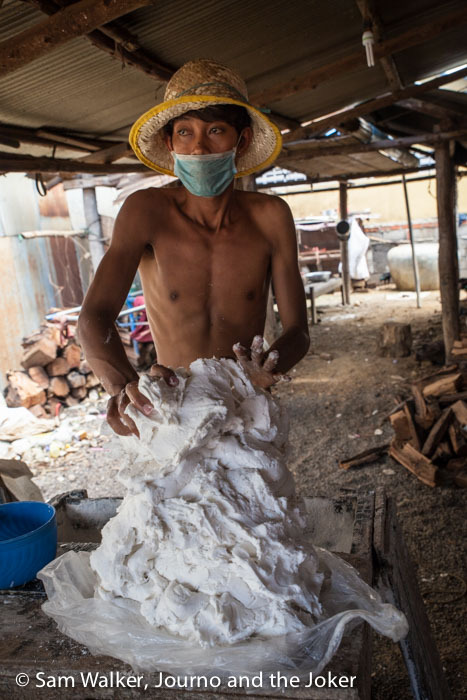 We then stopped in on a family making rice paper. It is a quick and efficient process where the batter is spread on a hot plate and when cooked is taken out to dry in the sun. Our day ended at Phnom Sampeau, about 12 kilometres south-west of Battambang, late in the afternoon. 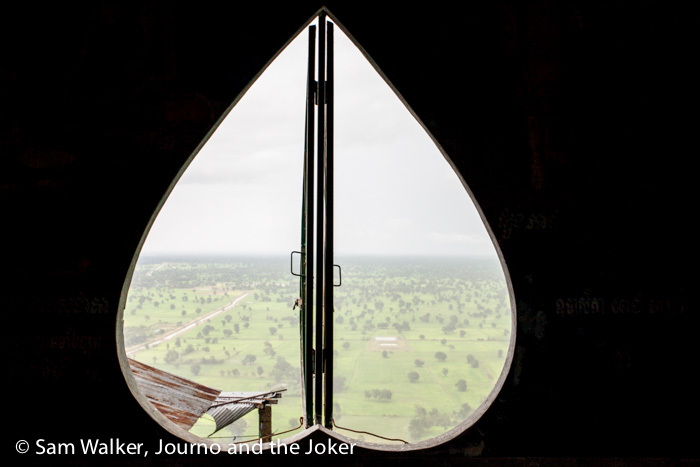 We took a moto up to the top of the mountain, stopping on the way to see the killing cave — a sad historical site from the Khmer Rouge era. And then on to the pagoda at the top of the hill. By this time the clouds were rolling in and the weather was changing but the views, out over the rice paddys were spectacular. 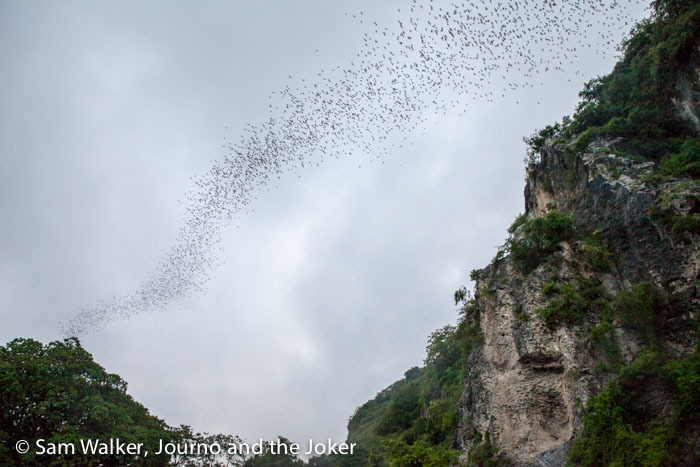 It was a soggy end to the day as we watched the incredible spectacle of thousands of bats leaving their home — a cave at the base of Phnom Sampeau — to head out into the night and hunt for food. It is one of Battambang’s famous experiences. The number of bats that live in this cave at the base of Phnom Sampeau is incredible and seeing them take to the sky is quite a sight. In the dry season you are more likely to be rewarded with a spectacular sunset as this takes place. But in the wet season you risk rain. It’s no secret, the highlight of most travel experiences for me is the people. Meeting new people and getting an insight into their life and culture is a privilege and despite language barriers and cultural differences it can amount to some wonderful connections. This trip — a humble tuk tuk drive through the countryside — was the ultimate Battambang experience. So, Battambang was a richly rewarding experience, thanks to Thean, who knew just the right places to take us. The Bamboo Train is another popular and fun activity in Battambang. Hey, great post. I was also in Battambang but did not enjoy at all the local market. 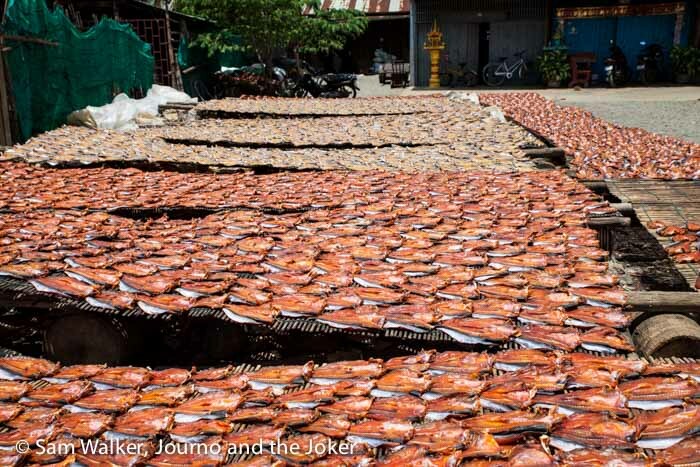 I couldn’t believe how the fish were stored until they got their heads chopped off. There were 20 or 30 in one bucket without any water, desperately gasping for air. That was before our cooking class, I refused to eat any fish or meat for that class. Was the market you went any better? The street food looks amazing. I liked our stay in Battambang, wish I could have even seen more of Cambodia. Hi Melanie. Thanks for reading. That’s pretty much standard for most markets in Cambodia. Very little water for the fish. The animals here are not treated with very much respect, which I don’t like but I kind of get it. It’s hard to imagine how little many of these people have and when you’re fighting for your own survival you’re not as likely to be concerned for animals. It puts a whole different spin on Buddhism. Hallo June. Yes, hard to believe some of the conditions people are working and living in here when you come from a western country. We are pretty lucky in the west. That said, the people here are usually happy and always have a big smile.